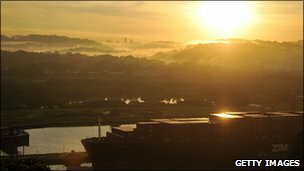 Colombia has announced it is negotiating with China to build an alternative to the Panama Canal. The proposed transport route is intended to promote the flow of goods between Asia and Latin America. The plan is to create a "dry canal" where the Pacific port of Buenaventura would be linked by rail, across Colombia, to the Atlantic Coast. Trade between Colombia and China has increased from $10m in 1980 to more than $5bn last year. The announcement came from the Colombian president, Juan Manuel Santos, who told the Financial Times that the project was "a real proposal... and it is quite advanced". China has been increasing its involvement across Latin America to feed a growing need for raw materials and commodities. According to BBC Bogota correspondent Jeremy McDermott, President Santos has departed from the emphasis on security of his predecessor Alvaro Uribe. Mr Uribe's Democratic Security Policy, backed by US military aid, is credited with halving the numbers of Marxist rebels and pushing them into the more remote jungles and mountains. Mr Santos is concentrating on what he calls "democratic prosperity", our correspondent says. He hopes that economic development will address some of the root issues of the 46-year civil conflict, such as poverty and the lack of opportunities, which have pushed people into being rebels or into the lucrative drug trade, our correspondent says.